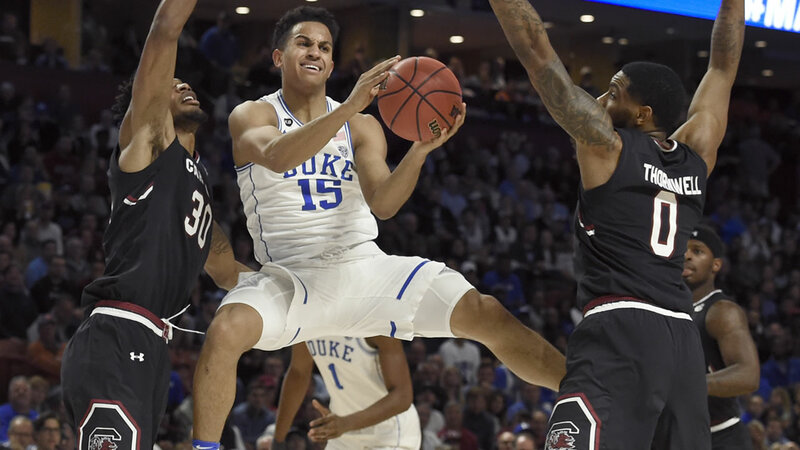 DURHAM (WTVD) -- Frank Jackson was probably the least heralded of Duke's Big Four freshman recruits of 2016 (Tatum, Giles, Bolden, Jackson), but with news Friday that he's staying in the NBA Draft (courtesy of Yahoo Sports), only Marques Bolden remains standing at Duke from that group. The consensus early feeling was that Jackson was only entering the draft process to get feedback, that he was surely going to be back for his sophomore season. As time went on though, that notion started to slip away and after a strong performance in yesterday's 5 on 5 scrimmages at the NBA Combine in Chicago, Jackson's mind was apparently made up. Jackson for me is a new breed of one and done. No hard family financial impetus and no guarantee he'll be picked high. Just wants pro ball. With D-League salaries going up, could really gut CBB in coming years. Guys leaving to apprentice as pros rather than play college. In other words, 30 shots a night for Grayson Allen. One and done life was glorious for Duke in 2015, otherwise it's been a roller coaster ride. We'll see what 2017-18 brings.